Natsuyaki and Suzuki have worked together in units such as Aa! and Buono! As they talk about their eagerness to show-off (!? ), for some reason, we get shown drawings of baby chicks? Has the impression you have of one another now changed from when you met at the 'Hello! Project Kids Audition'? Natsuyaki: At the auditions, we didn't really have any opportunities to talk, so from what I saw, Airi was really good at singing, and she could dance as well.... that was what I felt. But when we were in the same group, 'Aa! ', I found out that Airi really does things at her own pace. And recently through Buono!, I found out that she's a real gourmand (laughs). When I talked with her, I thought that she was level-headed, a girl of this generation, who, just like (Sugaya) Risako, will give out her own opinion. 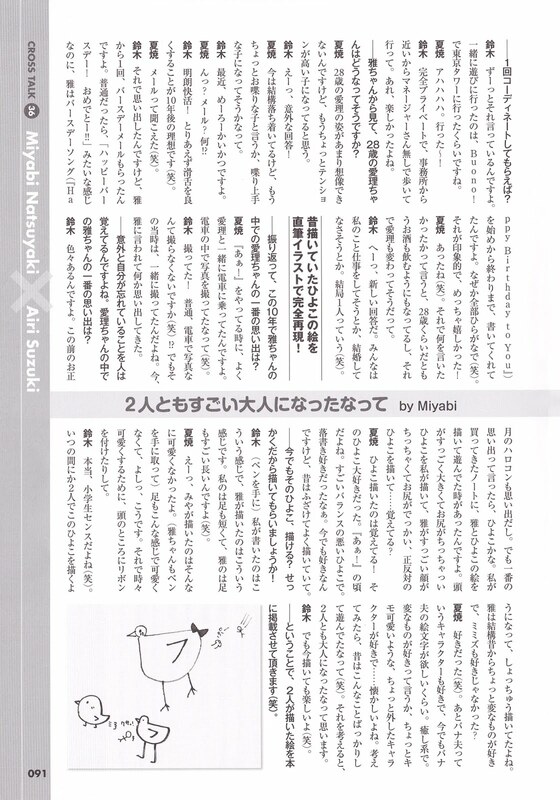 Suzuki: Miyabi was already cute from back then, so I was sure that she'd pass. We started talking when we joined 'Aa! ', but since we were kids back then, we'd talk about work. But I really liked how, even from back then, Miya was able to catch the rhythm, and she was fashionable, so I had this great impression that she'd be admired by girls. At rehearsals, I watched her in secret, but there weren't any occasions for me to tell her that (laughs). Miyabi has all sorts of unexpected facets to her. When I'm thinking that she's cool, she'd be anything but, talking with a with a shriek, building up a fuss with a 'yay' (laughs). 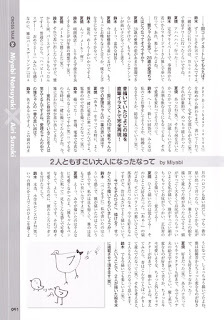 Also, Miyabi eats quite a lot as well (laughs). The 2 of them thought up moves that would make them completely stand out!? Fellow gourmands (laughs). Also, I just happened to hear that a common point between the 2 of you is that you're both showoffs!? Natsuyaki: That might be true. That's completely true of me (laughs). When everyone's out at Hello! Project concerts, we're often put in the same positions. And the 2 of us have discussions about what we should do, so that lets me talk with Airi even more. Suzuki: Ah, those are fun~ At this year's new year concert ('Hello! Project 2012 Winter ~Hello! Pro ☆ Pro Tengoku~'), the 2 of us were positioned right in the centre during the opening. We really were next to one another, so we both talked about making ourselves stand out, like 'We've got this opportunity!' (laughs). I can't do it on my own, but I talked about lots of things with Miya, which was really fun. Natsuyaki: There are huge numbers of people at Hello! Cons, and since we were near the centre, I was like, let's stand out! (laughs). What's more, there's also the fact that Berryz Kobo and ℃-ute have to show the way to the girls under us. So when everyone paused, Airi and I jumped (laughs). Suzuki: Since I'm the type that gets hidden when I'm in crowds (laughs). Suzuki: What's more, there are now more girls with long black hair, so I'll come out with plans to stand out with the instantly visible Miyabi. Up to now, when Takahashi (Ai)-san was around, it felt a bit awkward to show off when the senpai were around... But now we've got more kouhai, so I think that it's fine to show off. And then, it's like we just rush in! (laughs). Let's do it again!! Would you do something so flashy that the members of staff would have to stop you!? Suzuki: I'd like to do something at that level (laughs). 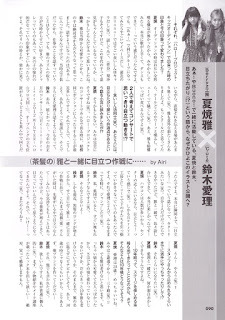 Natsuyaki: Together with Airi, I'll end up doing something weird and funny. Perhaps after 10 years, you have the composure to enjoy yourself on-stage. Well, how do you think the 2 of you will be like in 10 years time? Natsuyaki: Airi'll be 28? That's great. Since I'm 2 years older... Thirty (laughs)!? Suzuki: But I think that Miyabi won't age. Ever since she was small, she was cute and mature, and she hasn't particularly changed from those times. So I'm sure that she won't have aged, even 10 years in the future. Just as she is, she'll be perky, true to her name. Also, please make a Miyabi brand! You don't even have to wait until you're 30! Natsuyaki: Others have said that too (laughs). Suzuki: I personally want it (laughs). Firstly, I'd want you to come out with a mook where you introduce accessories and give a course on makeup! I'd definitely buy it and learn from it. How about you let her coordinate your outfits once? Suzuki: I've always been saying that. I think the only time we've hung out together is when we went to Tokyo Tower, when we were doing Buono! work. Natsuyaki: Ahahahaha. We did, didn't we~! Suzuki: It was completely in our private time, since it was close to the office, we walked there without a manager-san. That was fun. Miyabi-chan, from your eyes, how do you think the 28 year old Airi-chan will be like? 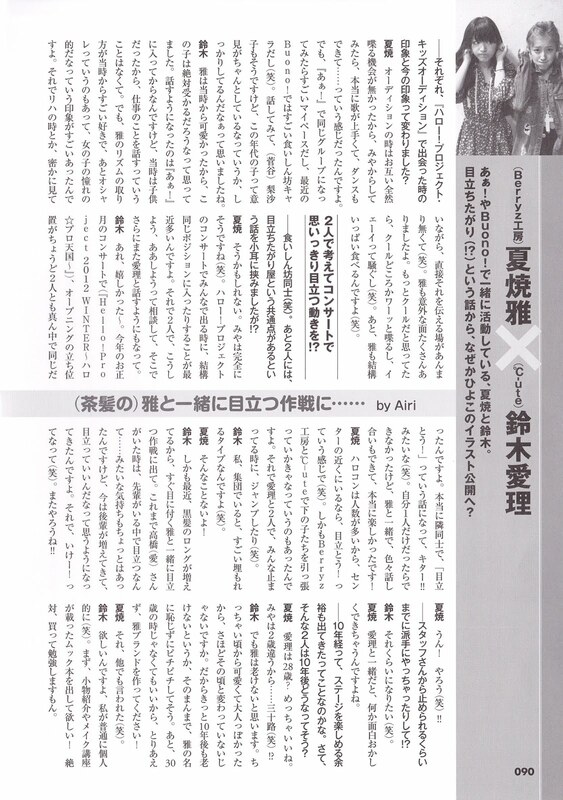 Natsuyaki: I can't really imagine a 28 year old Airi, but I think she'd be a girl who's even more hyper. Suzuki: Eh, that's an unexpected answer! Natsuyaki: You're pretty calm now, but I feel like you'd become a girl who'd talk a bit more, or rather, someone who's good at talking. Suzuki: Bright and cheerful! Anyway, ideally, I'd be able to speak smoothly 10 years in the future (laughs). Natsuyaki: I heard 'bride' (laughs). Suzuki: Which reminds me of a birthday message I once got from you. Normally I'd expect something like 'Happy birthday! Many happy returns!!' Yet you sent me the birthday song, written out from beginning to end. It was all in hiragana, for some reason (laughs). It left an impression, and made me really happy! Natsuyaki: That happened, huh (laughs). And if I could let out my mind, you'd already be able to drink at 28, and I feel Airi would change through that as well. Suzuki: Eh, that's a new answer. Everyone says that I'll be working, or that I won't get married. You're pretty much one of a kind (laughs). 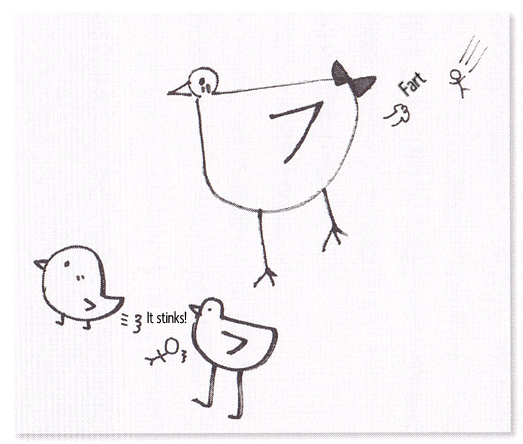 A complete reproduction of the hand-drawn illustration of chicks that they drew in the past! Miyabi-chan, looking back on these past 10 years, what's your biggest memory of Airi-chan? Natsuyaki: When we were in 'Aa! ', I'd often ride the train with Airi. We took photos inside the train (laughs). Suzuki: We did! Do people normally not take photos on trains (laughs)!? But back then, we did take photos. Now that Miyabi mentions it, it comes back to mind. Unexpectedly, someone else remembered what you'd forgotten. Airi-chan, what's your biggest memory of Miyabi-chan? Suzuki: I've got lots. I've even got memories from the recent New Year's Hello! Con. But if I had to choose the biggest, it'd be the chicks. On the notebook that I had bought, there was a time when I'd play around with Miyabi by drawing chicks. I'd draw chicks with a big head and a tiny behind, while Miyabi's would always have a small head and a big behind, chicks that were complete opposites to mine... Do you remember? Natsuyaki: I remember drawing chicks! I loved those chicks. It was back during 'Aa! ', wasn't it? They were really imbalanced chicks. I love to scribble. I still like to scribble even now, but in the past I'd often mess around by scribbling. Can you still draw those chicks now? Having gone through all those lengths, why don't you draw them for us!? Suzuki: (Pen in hand) The ones I drew were like this, while the ones Miyabi drew were like that. Mine have short legs, while Miyabi's had really long legs (laughs). Natsuyaki: Eh, the ones I drew weren't that unattractive. (Miyabi also picks up a pen) These kind of legs aren't cute either, right? They were like this. And to make them cute, I'd sometimes put a ribbon at their heads. Suzuki: It really fits with the tastes of primary school kids, doesn't it (laughs)? Before we knew it, the 2 of us were always drawing these chicks, we'd draw them frequently. Miyabi, you've always liked weird things from way back, like didn't you like earthworms?? Natsuyaki: I liked them (laughs). I also liked the character Banao, to the point that even now, I'd like a Banao emoji. He's soothing. Rather than saying it's a love of weird things, I like things that are gross-cute, characters that are a bit off-beat... How nostalgic. Thinking about it, in the past, we used to play around doing nothing but these sorts of things (laughs). Thinking about that, the two of us have become grown-ups. Suzuki: But even now, it's still fun to draw (laughs). And with that, we'll be putting what the 2 of you drew in the book (laughs).